Western Territorial Commander Commissioner Kenneth G. Hodder honored the couple for their more than 63 years of support Jan. 24 in Denver during a National Advisory Board event at the Army’s Harbor Light Center, with Commissioners Dave and Sharron Hudson, the Army’s national leaders, present. 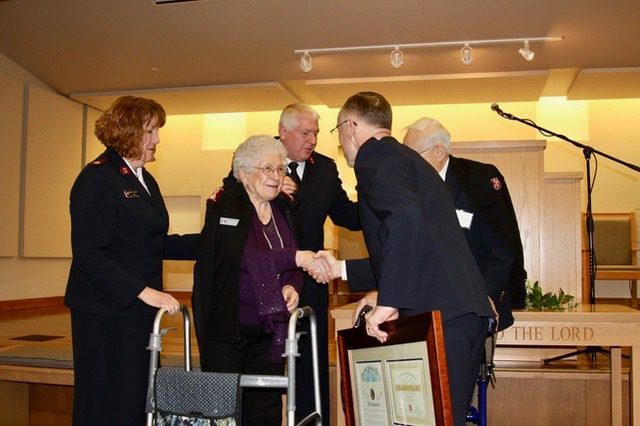 The installation capped off many awards the Fies have received over the years, including the “Others” Award, 50 Years of Service Award, Order of Distinguished Auxiliary Service, as well as lifetime membership in The Salvation Army Denver Metro Advisory Board. The legacy began in 1956 when family patriarch Merrill Fie moved to Denver. He joined Kiwanis International that year and rang The Salvation Army bell for the first time with the service club. Fie enjoyed himself so much, he came back the next year, and the year after that. He encouraged his employees and family members to join, beginning a tradition that has lasted 63 years, impacting thousands of lives for good. 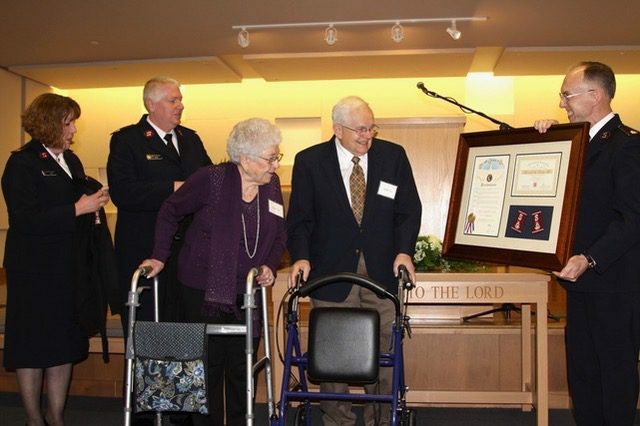 Merrill and Dorie Fie with Territorial Commander Commissioner Kenneth G. Hodder and Intermountain Divisional Leaders Majors Cindy and Mike Dickinson. Every year just before Christmas, the growing Fie family rings bells at The Salvation Army red kettles throughout Denver’s 16th Street Mall for a few hours. In 2018, more than 30 family members and their friends raised $81,000 during their annual Fie Family Bell Ringing Day. The newer generations have promised this tradition will reach 100 years. One grandson even found a place to ring a bell for The Salvation Army while studying abroad in London on the same day his family rang in Denver. The legacy doesn’t stop there. In addition to ringing bells for generations, the Fie family has changed thousands of men’s lives through The Salvation Army Harbor Light by providing the lead gift in the capital campaign to expand and update the facility. They donated funds to High Peak Camp to build a fully working gristmill and an 18-hole miniature golf course, allowing thousands of children to play mini golf among the camp’s majestic pine trees.